The months of January and February bring darkness and gloom to the good people who inhabit the earth’s vast Northern Hemisphere. In the New World as well as the Old, arctic temperatures, extreme precipitation, and memories of ill-advised holiday gifts can lead otherwise decent folk into isolation, depression, and weird brewing ideas. Fortunately the last of these can quickly and effectively ease the pain of the first two, and the Shelton Brothers, as always, are happy to enable our brewers’ every whim. In some cases, the beer descriptions themselves are worth the price! In recent newsletters we’ve alluded to the fact that the hitherto-conservative brewers of Britain are seriously freaking out as of late. 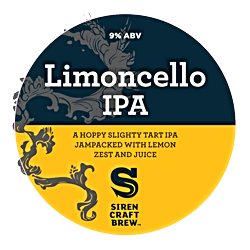 One particularly exotic result is Limoncello, Siren‘s collaboration with Hill Farmstead and Mikkeller. Say the brewers, in that typically restrained English tone, “This is a truly different beer.” The concept here was to blend the flavor and mouthfeel of the popular Italian liqueur Limoncello with the citrusy hop zip of an IPA. Made with heaps of lemon zest and juice, and “all the lemony hops available,” this 9% barley and wheat ale also goes through a 24-hour souring process, which imparts some serious tartness. Tally whoa! No scurvy this winter. Limoncello is available in 500mL bottles and 30L KeyKegs. Though legendarily rainy, England’s weather is relatively mild. When you get up to Canada, you’re talking real cold and snow. 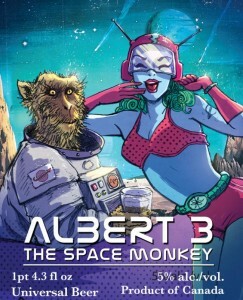 And here’s evidence that the otherwise-lucid brewers at Le Trou du Diable have got some serious cabin fever to pair with their latest gem, Albert 3: Space Monkey, a 5.9% bière de table. The official description: “Albert is a brave beast who was launched into space by the Trou du Diable team in an effort to conquer those palates that are perpetually searching for dry and hoppy beers. The data collected inside its pressurized cockpit indicates the presence of malty flavors combined with a hint of light, but lasting, bitterness. We are confident that, just like Albert, you will be blown away. Try it and get a taste of heaven!” Ok then. Sounds like someone’s been dipping into stronger stuff than table beer up there in Quebec! Albert 3 is available in 600mL bottles and 30L KeyKegs. Back in Europe, the Danes are also starting to lose it this winter. 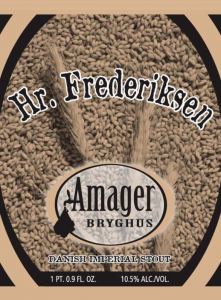 By their own admission, brewers at Amager have “gone a little crazy with the malt” in their 10.5% imperial stout Hr. Fredericksen. Hr. Fredericksen is available in 500mL bottles. Oh yeah, there’s another crazy person brewing in Denmark, sending us weird beer this winter. 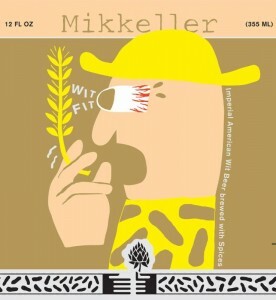 Fellow who goes by the name Mikkeller. He seems to be offering up some strange canned concoction, “Wit Fit” — a 6.2% witbier brewed with spices! Ok, buddy, whatever, we’ll put it out there and see if there’s any interest. Wit Fit is available in 12-ounce cans.